Once school let out, we packed up the family and headed out west for a California family vacation. We started in San Diego, and took our time driving up the Pacific Coast Highway to San Francisco. We stopped in several places along the route to take in the sites. 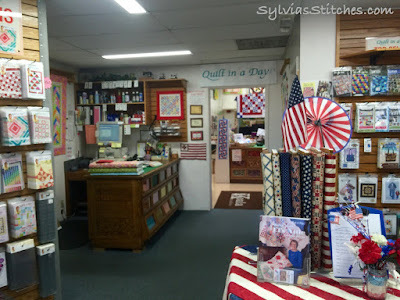 Before we left San Diego though, I took a little detour to San Marcos and visited Eleanor Burn's A Quilt in a Day Quilt Shop. 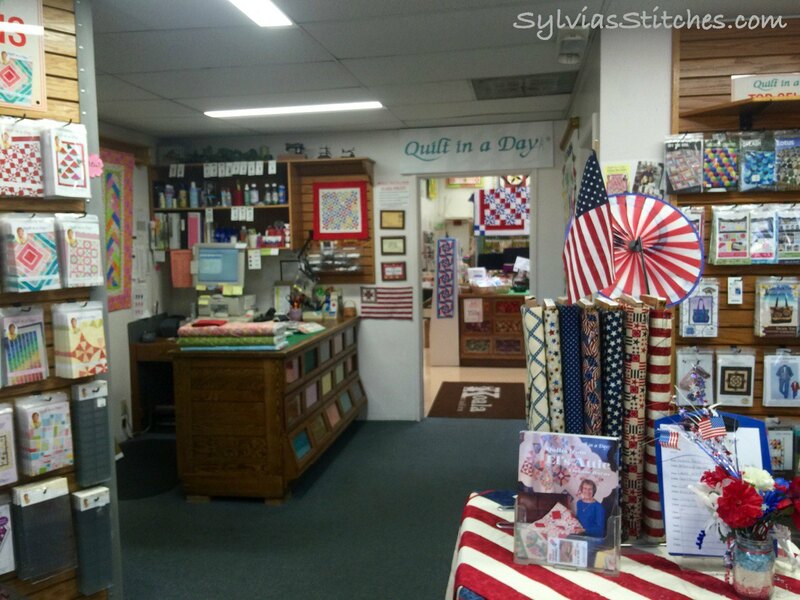 This location houses her quilt shop, hosts classes, processes her internet orders as well as hosts her show's recording studio. 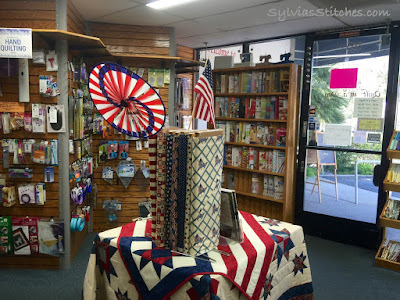 For your viewing pleasure, here is a photo tour of her shop. I tried to get a photo of Eleanor's entire space. I arrived at opening time and was the first customer of the day. 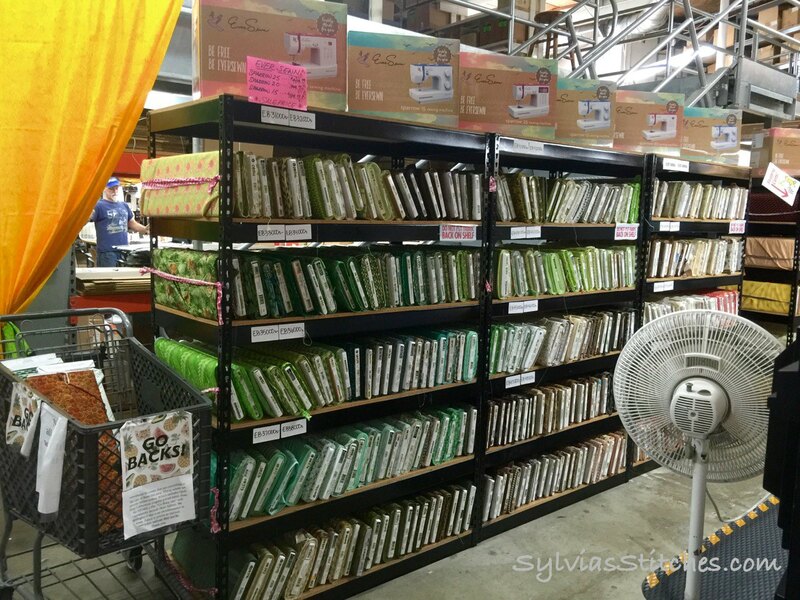 The sales person, Chris, was very friendly and helpful, and she totally didn't mind if I snapped some pictures. Here is what you see at the front of the shop. Lots of fun quilting supplies and Eleanor's patterns. Another view of the store front area. Walk through the door-way opening and you are welcome into a large brightly-lit room full of fabrics. 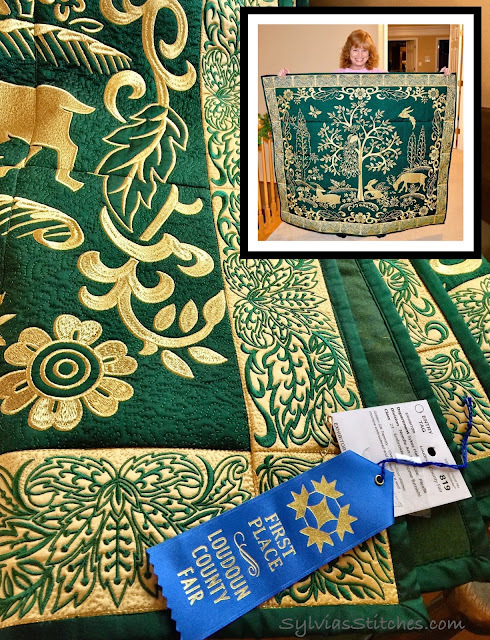 Lots of fabric and quilts to admire. To the near-right side of this room is another doorway. This area holds the sale fabrics. 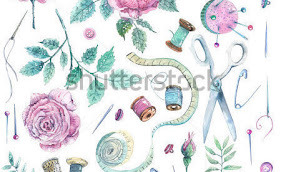 Behind the fabrics appears to be an order processing area. Out of site of this photo in the back area is her video studio. 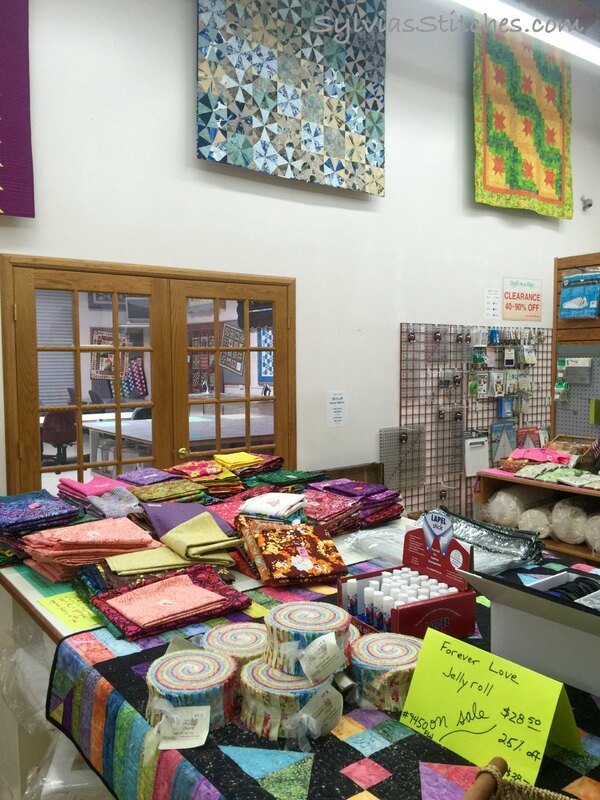 A classroom space is in the back of the first fabric room. 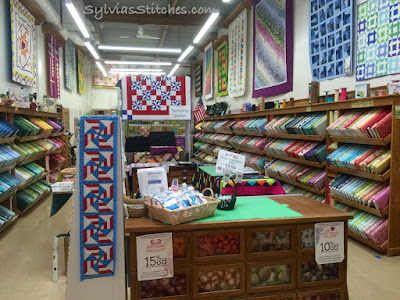 Sale fabrics and a peek into the classroom. 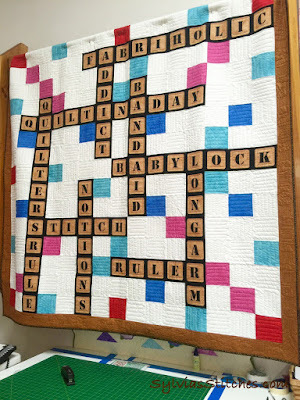 A fun scrabble quilt on display. 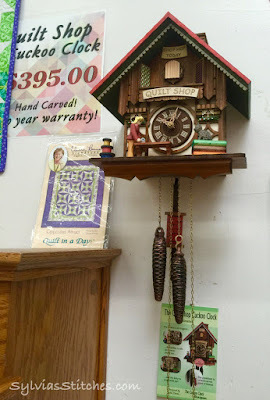 I saw an advertisement for this Quilt Shop Cuckoo Clock recently. Nice to see it on display. This may have to go on my Wish List. So what did I find for myself you ask?? Just a few things I could fit in my suitcase for the flight home. I picked up Eleanor's Braid in a Day pattern, along with batik fabrics to make the quilt in browns, blues and blacks. 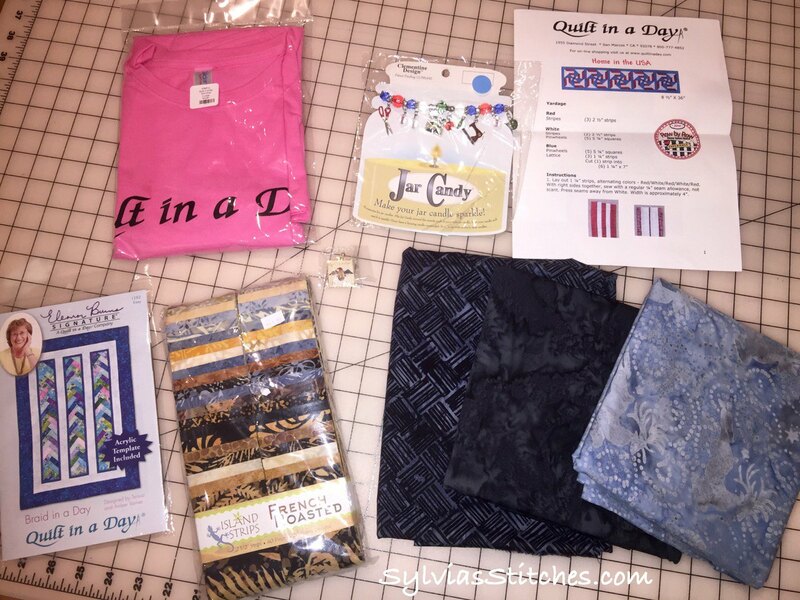 Also found a few other goodies including a Quilt in a Day tee shirt, Quilt-theme Jar Candy, Quilt in a Day charm and their row-by-row pattern. Eleanor was not at the shop on the morning of my visit. Chris said Eleanor is doing well though. 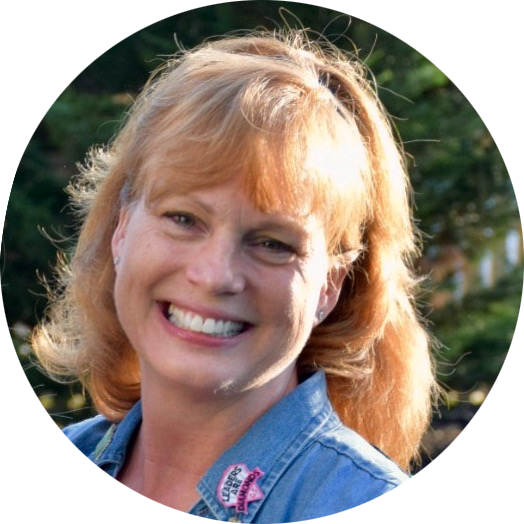 :-) I have met Eleanor before, when she was in town to teach several few years ago. Sorry I missed her on this visit. One final photo to share is from California. 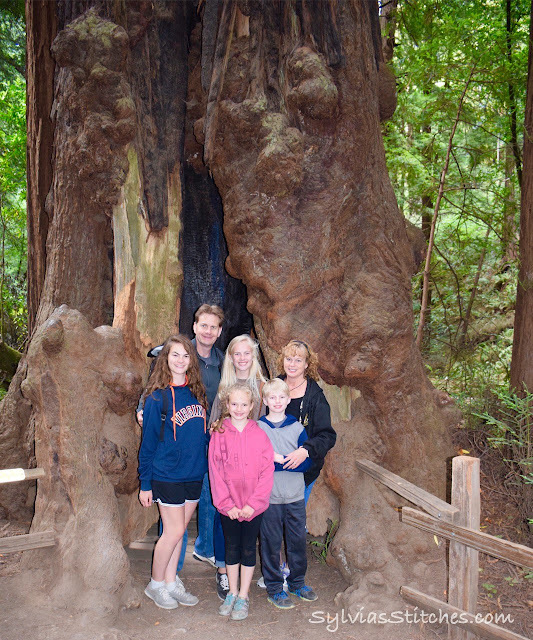 Here we are at Muir Woods Redwood Forest. Those trees are amazing! Redwoods are the tallest trees in the world! !